Golden Tee® Golf, the most played coin-operated video game franchise in U.S. history, returns to mobile with Golden Tee® Golf Mobile Edge. Enhanced gameplay is the star! Use the new quick-play controls to curve the ball around hills, add backspin on greens and get roll for extra distance on the fairways. Like the coin-op game, the ball truly reacts to the terrain by rolling down steep slopes and bouncing off rock ledges, creating strategic decisions never-before-seen in a mobile golf game. Golden Tee® Golf Mobile Edge features 4 all-new challenging golf courses, quick-play putting and driving games, golfer customization and Golden Tee® Moments of the Game replays of your greatest shots! You can also connect to the Golden Tee® coin-op world and check your stats, see contest history and even locate a coin-op machine in your area – all at the click of a button! I don’t know about the game being the most played coin-op franchise ever (I thought that honor belonged to Pac-Man; but they do say that the game has been played over a billion times so maybe it’s surpassed Pac-Man recently) but if you love Golden Tee, this is the only way to take it with you for now. 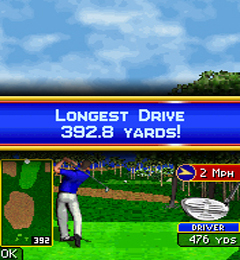 Interestingly enough this game can actually connect to the internet, retrieve their stats from their game online and even find a Golden Tee machine in their area. 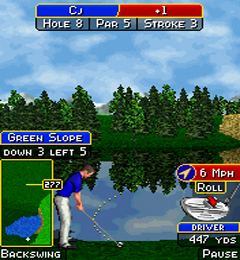 You can pick up Golden Tee Mobile for $9 although I do not see any specs it requires from a phone on the site.